The two parts of this show recall moments in the history of photography, but with important differences between the original moments and their invocations here. The Photogenic Drawings are tracings of advertisements from U.S. Camera Annual for 1952, 1953, and 1954. The tracings are meant to recall the moment when Henry Fox Talbot was moved to invent his version of photography, which he developed in England in the 1830s as Daguerre was developing his process in France. Talbot, a gentleman scientist, used a camera lucida to record picturesque scenes when he traveled, for example, views of Lake Como. A camera lucida is an instrument that when directed at a scene produces a virtual image of the scene that to the person looking into the instrument appears to fall on a piece of paper. The viewer follows the delineations of this image with a pencil and so produces on the paper an image of the scene. It is a matter of running the pencil over the lines that constitute an image already there on the paper. In other words, a drawing made with a camera lucida is in principle a tracing. Talbot was dissatisfied with his efforts (his wife did better camera lucida drawings), so he was led to develop a process that would do the drawing, the tracing, for him. The version of photography that he invented became the classic form. Daguerre’s process produced a unique image, while Talbot’s method produced a negative, from which any number of positive prints could be made. Talbot called his process photogenic drawing, or drawing produced by light. In giving his process this name Talbot showed that in his conception photography was the fulfillment of drawing with a camera lucida, drawing of such a peculiar kind that it is most accurately called tracing, because it doubles an image that is already there on the plane of the paper. This image that is already there is the guarantor of the value of the attempt to reinscribe it. Talbot’s photogenic drawing was automatic tracing, tracing by optical and chemical means without the nuisance and liability to error and clumsiness of having to perform the labor of wielding the pencil. Talbot’s conception of photography as drawing was further reflected in the title of a book he published as a series of portfolios beginning in June 1844. The title of this work was The Pencil of Nature. It was the first book of photographs, and the images were actual photographic prints. To put it polemically, even if Talbot recognized what an extraordinary thing photography was, how far beyond drawing it went, it was in his mind a continuation of drawing of a kind that can only be called tracing. Tracing was already photography, photography remained tracing. To simplify, there was a moment when tracing and photography were two different forms of the same thing. The scenes that Talbot was moved to find worthy of tracing with the camera lucida were scenic vistas. After he invented photography the first scenes he recorded were the surroundings of his daily life in the English countryside. The ads I have traced are as moving and powerful to me as I imagine the picturesque views of the Italian lake district were to Talbot, and as personal and intimate as the photographs Talbot made of his domestic surroundings. These ads embody the ascendance of photography in its classical form. They appeared at a moment when photography eleven decades after its invention had secured its identity and was confident of its place. Photography was then known in all of its technical dimensions. Everyone knew what a photograph was, how it was produced by means of light and optics and chemistry, what photographs did, what they could be used for. And this moment came as photography’s classical period was drawing to a close. By coincidence, this was also the moment when as a child I became aware of photography. It was unthinkable to me that the brands and processes that made up the landscape of photography when I came to know it would ever be any different. It would go on forever without change, not just the products that were being advertised, but what photography was at the time the ads appeared. Photography as it represented itself in these ads was a scene of optimism. Photography foresaw its future as more of what it had already become, marked only by incremental technical improvements: faster film, finer grain, bigger f-stops. The future that photography then imagined for itself, the optimism, the confidence, the sense of having arrived at a stable identity, has now of course disappeared, along with many of the companies and products that these ads are for. Ansco has disappeared. DuPont stopped making photographic paper. Argus has disappeared. Haloid turned into Xerox and got out of the business of making photographic paper, Rollei had stopped making the twin lens reflex that was the foundation of its reputation for decades. Gevaert was absorbed into Agfa. Flexichrome has disappeared. Kodachrome has all but disappeared. Kodak itself has not disappeared, but it is engaged in the urgent project of self-transformation to adapt to the digital age. These disappearances (I really want to call them extinctions) create for me the most heart-rending pathos, not just at the loss of things that were once familiar and that I imagined as permanent, but because they are a displaced reflection of the passage into oblivion of the identity of photography that seemed so utterly secure at the time these ads appeared. Their innocence of what was to come is painful to behold. The photogenic drawings use tracing, Talbot’s conception of what photography was at the beginning of its first epoch, to inscribe a moment that came toward its end. This epoch may have ended only a few decades ago, but from the vantage point of the present it seems as remote from us as classical antiquity. Tracing today has a bad name. It produces a picture with rote effort. It is rank copying of a kind so banal and blatant as to invite the accusation of cheating. It’s what unimaginative children do. One purpose of the photogenic drawings is to redeem tracing from its undeserved bad reputation. It ought to be enough to redeem tracing to point out that it called for photography, that it was responsible for how one version of photography came to be invented, and remained in photography after its invention. But if that is not enough, there is tracing’s earlier history. Tracing, or the impulse to trace, was a possible response to images created by the camera obscura. It is a matter of debate whether painters used such devices. But beyond conjecture is the fact that tracing was a part of that crowning achievement of the Renaissance, perspective. Tracing was implicit in perspective from the beginning, at least in principle, and it came to be explicitly recognized soon enough. One model for understanding perspective was as a window: making a perspective was a matter of tracing on the plane of the window the image that the world became when it intersected the window. Tracing, in other words, far from being the recourse of children wanting to achieve a result beyond their skill as draftsman, a method of picture-making so easy as to invite the accusation of laziness or cheating, has an august history that goes back to a discovery in picture-making that few would care to ridicule. Any photograph taken with a camera is automatically and inevitably a perspective image. To the extent that perspective is tracing, and as long as photographs are made with cameras, tracing remains in photography. To further redeem tracing, it is important to recognize the reasons that underlie the impulse to trace. Tracing is the sign of the wish to act on the power that an image has for you. It’s a kind of devotional exercise, an homage. You trace the image for which you have tender feelings, or love, or adoration, or veneration, or fascination, or obsession. Tracing is a way of trying to make something yours, a graphic equivalent of incantation. Tracing is a way to try to get as close as possible to something while at the same time acknowledging that the act you’re performing to get close remains forever separated from the thing you’re trying to get close to. When Talbot made a camera lucida drawing, as when he made a photograph, the scene he inscribed had to be there in front of him. He couldn’t work from an image, he had to work from life, and he traced the image that life gave him. That’s one of the beauties of making a tracing from a photograph, or in this case, advertisements. It’s a record of a moment that has already occurred, perhaps a long time ago. It is a sign of something that is already irretrievable. What is in the photograph, or the ad, may have disappeared into the past, but by tracing the image you act out your wish to overcome the distance between you and what has vanished. The labor of tracing enacts the wish to bring the absent object closer. 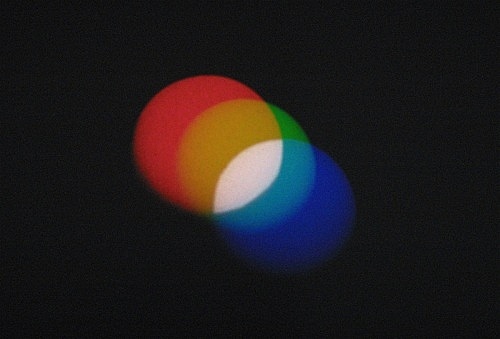 Color Balance is a film installation that was first done in 1980 in Super-8 and is reconstructed here in 16mm. It recapitulates in part the first photographic reproduction of color, demonstrated by James Clerk Maxwell in 1861. Using black-and-white film, Maxwell photographed a piece of tartan ribbon three times with the camera in the same position. For each exposure he put a different colored filter in front of the lens: red, blue, and green. The framing for all three black-and-white images was identical but they looked different from each other because they had been filtered differently. Maxwell then put each of the three black-and-white images in a different projector, and with the corresponding filters in front of the lenses projected the images on a screen so that they coincided with each other. The three images, red, blue, and green, together reconstituted the original scene. Maxwell’s photograph demonstrated additive color mixing. 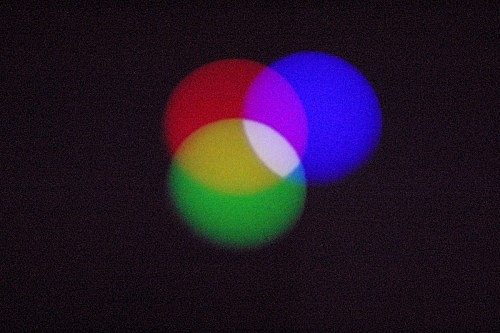 Three lights, red, blue, and green, when projected in differing intensities on a white screen can produce almost the entire range of color that the human eye can perceive. When red, blue, and green lights are superimposed on each other in equal intensities, they make white. 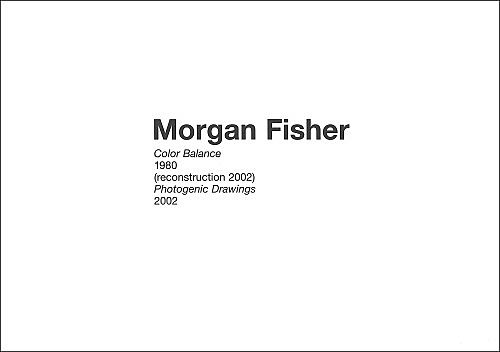 The subject of Color Balance is a white ping-pong ball that is balancing on a column of air in front of a black background. The scene is a monochrome. I recorded the scene with a single roll of black-and-white film. Maxwell began with three separate images each filtered differently, but I began with a single image, and this image was not a still image, but one that moved. Maxwell made his color separations in the initial photography, but for Color Balance the separations were made after the initial photography in the film lab. Instead of using black-and-white film with colored filters as Maxwell did, Color Balance incorporates the colors into the film itself. The lab printed the original roll of film three different times, each time with a different filter to produce three separate negatives that were cyan, yellow, and magenta. From these color negatives the lab made the corresponding color positives, red, blue, and green. Like the negatives, the prints are identical to the original master image except for their color. Each of the three prints is projected by a separate projector. The projectors are aimed so that the images coincide with one another. 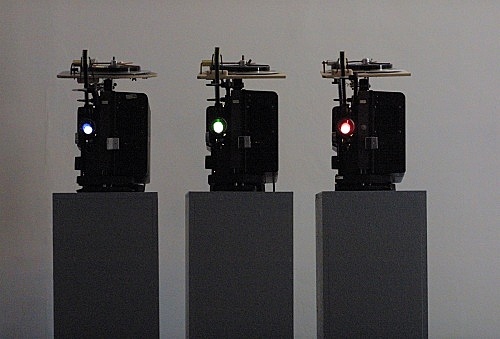 The arrangement exactly replicates Maxwell’s three projectors each projecting an image filtered a different color to reproduce the original scene. The correct reproduction of color in Maxwell’s demonstration depended on the correct registration of the three images in relation to one another, as three-strip Technicolor later did in a different form, and as color reproduction in the graphic arts does to this day, for example color reproductions in magazines. For the final result to look like the original scene, there has to be perfect registration between colors. In the correct reproduction of color, perfect registration is the unspoken ideal. Maxwell’s tartan ribbon was stationary. This made it possible to achieve perfect registration among the three images and so to reproduce the original scene. The ping-pong ball in Color Balance, unlike Maxwell’s tartan ribbon, is not stationary but is in constant motion. If the projectors ran in synchronization, it would be possible to register the images so that the identical frames in their three different colors were shown by the three projectors at the same time, and so reproduce the original scene just as Maxwell’s procedure did, but as a moving image. The image on the screen would be a color print of a film that was originally shot in black and white. (The original scene itself was monochromatic, a white object on a black background, so the projected color image would in principle be as much a reproduction of the original scene as it would be a color print from a black-and-white film of the original scene.) In any case, the scene would have been split apart into the separations, then the separations would have recombined on the screen to reproduce the unity of the original scene. That is what perfect registration in color reproduction does: it hides the fact that the original scene was divided up into separations that were then recombined. But in Color Balance the projectors do not run in synchronization, they run at different speeds, so the relations among the three images are constantly changing. If the three ping-pong balls are ever in register, it is a matter of chance. Most of the time there is not one white ball, but three balls, red, blue, and green. But the balls usually overlap to some degree. When two balls overlap, they produce one of the negative colors. Red and green make yellow, red and blue make magenta, blue and green make cyan. And when the three balls overlap, the red, blue, and green make white. When the three balls chance to fall into register to make one white ball, or are close enough to being in register to be seen as a single image, it is usually for the briefest of moments. And in that brief moment, perfect only by chance, color disappears. Color Balance embraces something that would ordinarily be called an error to create abundant opportunity for color to make its appearance. The deliberate lack of registration in Color Balance reveals what conventional color reproduction strives so mightily to efface, the fact that color reproduction depends on splitting an image apart and then recombining it. Color Balance embraces imperfect registration to bring out the richness and complexity of color relations that are the necessary foundation of color reproduction but are forever suppressed in the service of its ideal. Most of the time Color Balance fails to reproduce the original scene. In its failure to achieve perfect color reproduction, Color Balance does something else: it liberates colors from their servitude. And these colors are what the lab calls absolute colors. The pieces of film that make up Color Balance are loops. The projectors run at different speeds, so the relation between the images is constantly changing. There is no beginning, there is no ending. Color Balance can go on forever. Before films were projected there were devices for viewing photographic film images such as the kinetoscope, a viewing cabinet that permitted only one person to see the film. But film in its classic form began with projection, which permitted a number of people in a dark room to see the same film at the same time. Projection is nothing more than an image magnified and displaced through space. And yet because of the complex social and institutional effects that this simple phenomenon produces, projection became the standard condition for the viewing of motion pictures. Thanks to video and the computer, projection is no longer the indispensable condition for the viewing of films. 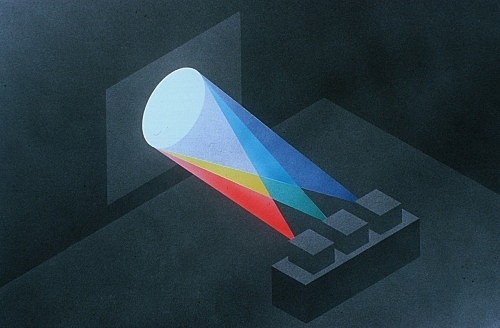 The overwhelming majority of films can be viewed on a television monitor or a computer screen, and there are people who think that this is no different from seeing a film projected. 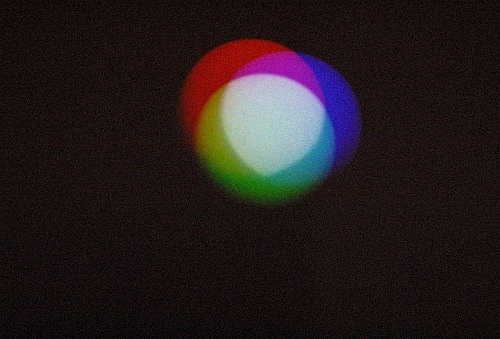 Unlike almost all other films, Color Balance requires projection. Three beams of light must be projected one on top of the other. The film exists not in a single strip of film but only on the screen, as the superimposition and interplay of three separate images, images formed by the projection of light.